Are you looking for the best drag and drop WordPress page builders? Building a website easy with a drag and drop page builder. WordPress page builders allow you to create, edit, and customize the layout and look of your site. In mere minutes you can have a great-looking site and you don’t have to know a thing about web design or code. There are countless WordPress page builders available to choose from, so, in this article, we’ve rounded up the best drag and drop WordPress page builders so you can start building your website. Why Do You Need a Drag and Drop WordPress Page Builder? If you’re a WordPress beginner, it’s very difficult to customize your website theme or layout. With a theme, you have limited options for customizing. You may be able to change your colors and fonts and add images, but if you really want a unique website that’s all your own, you’ll have a hard time creating it without knowing code like HTML or CSS. Don’t worry though, there’s a solution! With drag and drop WordPress page builders, you can easily transform the look and layout of your WordPress theme. A drag and drop WordPress page builder does exactly what it sounds like it does. With just a click of a button and a drag of your finger (or computer mouse) you can add any feature you want, to any place you want, on your WordPress blog or site. This makes it super easy to customize your WordPress website. But there’re a lot of drag and drop WordPress page builders available, so how do you know which WordPress page builders are the best? Look no further! Check out our list of the 10 best drag and drop WordPress page builders, compared. Beaver Builder is one of the best premium drag and drop WordPress page builders out there. 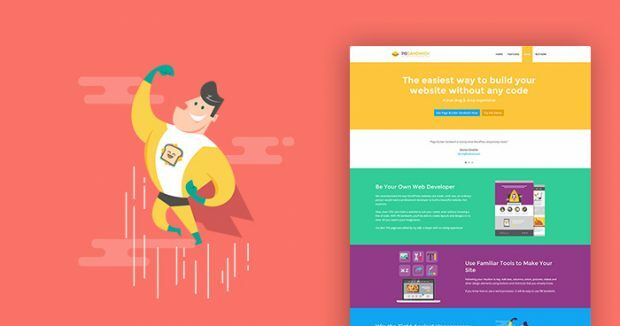 With Beaver Builder you can get complete control of your website and build beautiful pages simply by dragging and dropping. This WordPress page building software comes with an assortment of gorgeous themes to kick-start your creativity and save you time. You can pick one of Beaver Builder’s stunning themes, replace the text and images with your own, and you’ve instantly got a new, more professional looking page. Also, when you create a page you really like, you can save it as a template and use it over and over again or export it to another site. The best part is that the Beaver Builder page builder plugin can be used with any theme and if you want to change themes you can, without losing your content. Even if you decide to stop using Beaver Builder, all of your content goes right back to the WordPress editor. So you never have to worry about losing what you’ve worked so hard on. Beaver Builder offers packages starting at only $99 for use of their page builder on an unlimited number of sites. And their built in on-boarding tour will help you learn how to use their tool in minutes. Elementor is another popular choice for WordPress page builders. With Elementor you can easily create customized landing pages, a blog, or online store. Their visual Theme Builder lets you customize your header, footer, and other areas of your website. You can add over 80 design elements to your site including an image carousel, progress bar, video, buttons, social icons, and much more. With their Live Editing you can view what changes will look like with other elements immediately and every change you make is instant making for a better user experience. 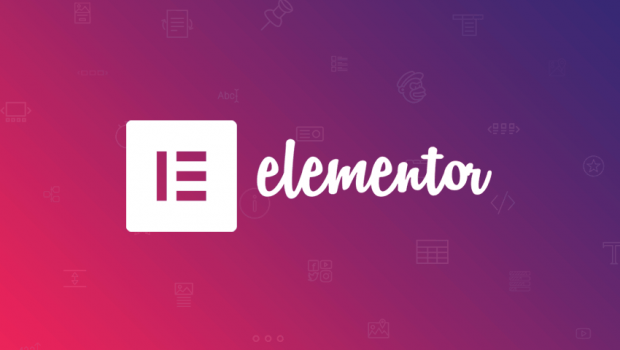 Elementor works seamlessly with almost any WordPress theme or plugin, so you don’t have to give up what you’re already using. They offer plans starting at $49 for 1 website or you can upgrade to their unlimited plan for $199. The Divi Builder by Elegant Themes is a great visual drag and drop page builder for any WordPress theme. Divi offers 46 content modules, which are like building blocks and can be combined in many different ways to create a totally unique website. Some of the content modules include audio player, comments, countdown timer, pricing table, portfolio, and many more. You also have endless layout options with Divi’s 3 different section types and 20 row types. The Divi Builder has a minimal style and is very easy to use but it has a ton of awesome controls. You can duplicate any element with a single click, disable an item to hide it on the front end of your site, lock an item to protect it from further editing, and you have unlimited undos and redos. You can sign up with Divi today for only $89 per year or get lifetime access for a 1 time payment of just $249. Themify Builder is another great drag and drop page WordPress page builder. Themify Builder is easy to use, so in minutes you can design any layout you can imagine. With their live preview you can watch your new website come together as you build it. You can also choose from over 40 pre-designed layouts to create professional pages for your site in even less time. Themify Builder comes with some fun and unique features too including animation effects that trigger when the elements are present in the viewing area. 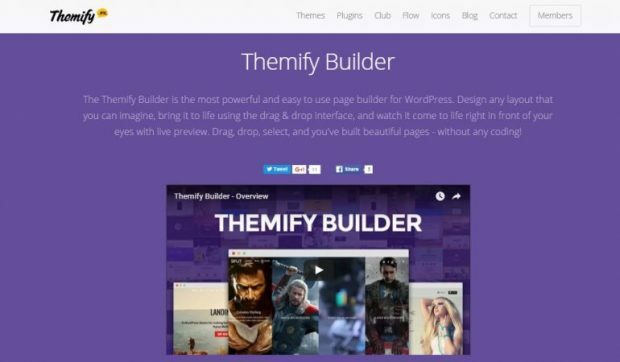 The Themify Builder is completely free to download and works with any WordPress theme. If you want some more features like infinite scrolling, slideshows, and video slider, you can purchase their addon bundle for only $39. Get Started with Themify Builder Today! SiteOrigin is a free responsive WordPress page builder. The SiteOrigin page builder makes it easy to build grid-based content that adapts to mobile browsers. Their simple drag and drop interface means you can create beautiful pages without touching any code. SiteOrigin integrates with any theme and you can still use all of your favorite WordPress widgets with the page builder. They also offer live editing so you can how your page will look as you’re creating it. Another awesome feature is their history browser, so you can easily fix any mistakes that happen. Like we mentioned earlier, SiteOrigin is completely free for an unlimited number of websites. It’s a great simple drag and drop page builder if you’re just starting out. Get Started with SiteOrigin Today! BoldGrid allows website building beginners to create stunning pages in no time and without any coding skills needed. With BoldGrid you get access to a image gallery and over 200 free and professionally designed WordPress templates. Using their easy to use drag and drop editor, it’s easy to customize any template and make it all your own. Building pages is also super simple with BoldGrid blocks. Blocks are pre-built page elements that are pre-populated with content and easy to edit. BoldGrid also offers a ton of instruction videos to help you out along the way if you get stuck. You can get access to all of BoldGrid Premium’s tools and services including their drag and drop website builder for only $60 per year. Other features included in the plan are premium support, built-in SEO analysis tool, and automated and secure upgrades and backups. Get Started with BoldGrid Today! Another awesome drag and drop WordPress page builder is WPBakery Page Builder. With over 4 million users, it’s one of the most popular choices available. Their front end and back end drag and drop page builder makes it easy to create a responsive website. You can use WPBakery Page Builder with any WordPress theme you want. They also offer over 50 content elements, templates, and addons that are ready to use, so you can quickly build great pages for your site. You also get access to their Template Library to download any template you like without restrictions. WPBakery Page Builder is also compatible with popular WordPress plugins including Yoast SEO, WooCommerce, and more. 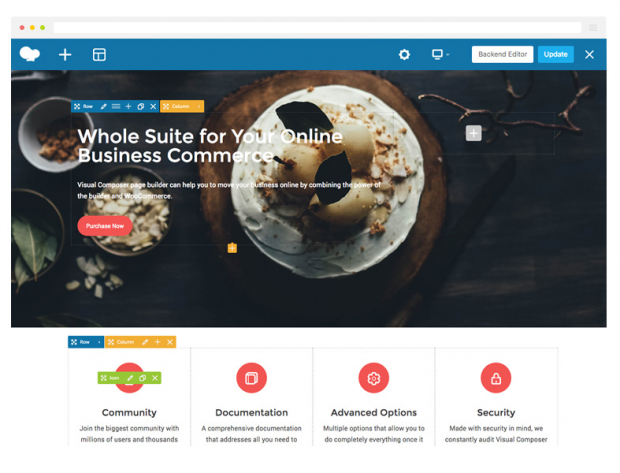 If you want to purchase WPBakery Page Builder you can for only $45 for use on a single site, free updates, premium support, and access to the Template Library. Get Started with WPBakery Page Builder Today! Live Composer is a great, free open source WordPress page builder. Their innovative page builder with a drag and drop interface comes with 40+ content modules for quick and easy page building. With Live Composer you can also see what your page will look like as you create it, no switching back and forth between tabs. Live Composer’s basic page builder plugin is free but for more features you need to purchase their Official Extensions Pack starting at $49 for a single site. Extensions include mega menus, third-party slider plugins, video embed, and more. Also if you want your site to be integrated with WooCommerce, you’ll need to purchase WooCommerce integration starting at $69 for a single site. Get Started with Live Composer Today! With Page Builder Sandwich, creating website pages is as easy as building a sandwich. This click and type, drag and drop WordPress page builder is perfect for beginners who want to build awesome looking site pages. Use their professionally prepared landing page templates and small pre-designed sections to create a page in minutes. You can also customize everything to suit your needs. You can also use your own plugins easily and avoid manually typing shortcodes with their unique feature called Shortcode Mapping. The Page Builder Sandwich plugin can be downloaded for free. If you want to unlock premium features like page templates, pre-designed sections, countdown timers, pricing tables, and more, you can upgrade starting at $39 for one site. Get Started with Page Builder Sandwich Today! Make by The Theme Foundry is a drag and drop page builder that’s made to look just like a native component of your WordPress page editor. Not having to learn how to use a new interface makes it even easier to build new pages for your website. With just a click of a button you can add full-width banners, columns, accordions and panels, and more to make your website pages stand out. Make also has over 100+ Customizer settings, so you can adapt every element of your website to look exactly the way you want it. You can start using Make for free and still get access to the Make Layout, Columns, Banner, and Gallery sections. But if you want additional builder sections, full eCommerce support, and advanced layout options you’ll need to upgrade your account. Upgrades start at $99. Get Started with Make Today! Now that you have a bunch of drag and drop WordPress page builders to choose from, we hope you find the best option for your needs. Start building your website today, it’ll take no time at all using any of these page builder plugins. If you enjoyed this article, you might find some of our other articles useful as well. Check out the 10 Best Email Marketing Software to Grow Your Business.